Thrift stores aren't the only way to get in your shopping fix. There are other extremely budget friendly places to go for secondhand goods. 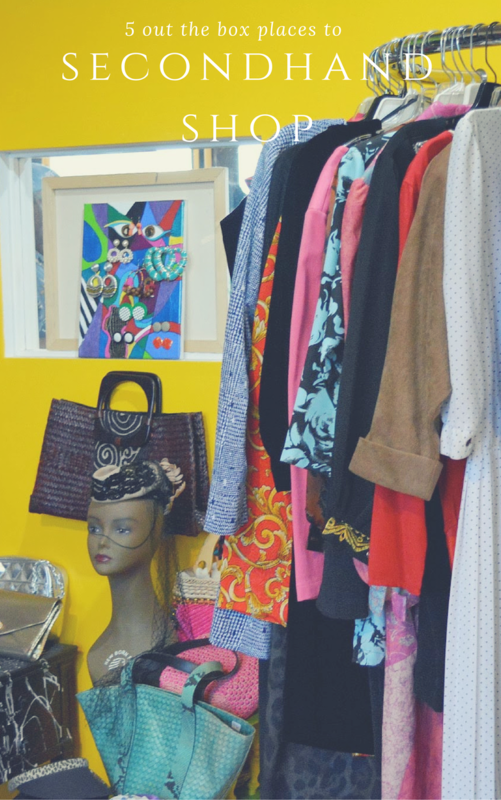 These five spots can be just as affordable and just as fun as a charity shop. They're a great way to spice up your thrift life and take it to the next level! Online resale is booming right now. You can find stores on Instagram and online garage sales on Facebook in addition to shopping eBay and Etsy. It's convenient with access around the clock. Some stores are ultra curated so you have the opportunity to find a dealer with just your style in one location. Online stores from Poshmark offer community just like some of the major social networks. Admittedly, this isn't a shop I've taken full advantage of. I like to feel my fabrics and thoroughly inspect what I'm getting beforehand. I actually enjoy digging around for treasures. Some thrifters aren't into all that fuss so an easy to find curated collection is the way to go. I did find one of favorite thrift finds on Facebook. I fell in love with the convertible dashiki dress from, my fellow thriftanista, Bettie of 14th Street Vintage. Estate sales happen when the entire contents of a home are for sale. The condition of items are usually in really good shape and not picked over. The sales normally take place Thursdays thru Sunday. You can find sale details and pictures by searching craigslist for sale section or esatesales.net. It can be a bit intimidating going to the first one but you'll love it once you get the hang of it. This is also a great place to bundle and make offers. Just like a garage sale, you have to go early for the best choice in treasures. If you go at the end of the sale though, you're likely to pay less as the leftovers are usually marked down at least 50%. Some of my favorite finds from estate sales include a $40 vintage Louis Vuitton bag, a $20 Bottega Veneta portfolio, and just recently a $20 midcentury office desk for my husband. The prices would surely have been higher and behind the counter had I found them in a thrift store. You can find some of everything at flea markets -- crafts, rusty junk, bags of socks, grocery items and vintage treasures. Plus they have yummy tasting food and beverages that have about a million calories. So worth it though. It's a treat for the eyes, ears, and mouth. Flea markets are where you haggle. You must carry cash. Know what you want to pay and haggle for the right price. I'm not very good at haggling as I like to say as few words as possible. I do like a good deal so if I find something I really want, I can muster up enough courage to make an offer. A trio of vintage earrings lit my eyes of and moved to make my very first transaction. I like garage sales but there's an awful lot of driving around from sale to sale. This can be time consuming. It's better if you can find an entire community or counties coming together to bring you sales that can stretch on for miles and miles! It's not a hit it and quit it kind of set up. These can be weekend long road tripping events. Nebraska's Junk Jaunt is on my list now that I have Unclaimed Baggage under my belt. I'm ready to venture out and do more thrift road trips. A swap parties is a clothes shopping event where thriftanistas bring gently used items from their closet to a central location and trade with each other. There are usually rules so one person doesn't walk away with all the things and you go home empty handed. It works outs and it's a lot of fun especially if cocktails are involved. Swap parties can be done informally between you and your circle of friends or become a spectacular event like this one I attended last year hosted by Style, Meet Life. If you can't find one in your area, you can always throw one yourself with these helpful tips. Outside of the thrift store, where do you shop for secondhand fashion?